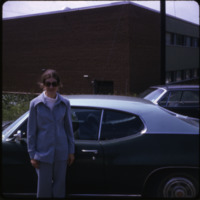 Image shows a woman in a pantsuit standing next to a two-door car, possibly on the campus of Appalachian State University. 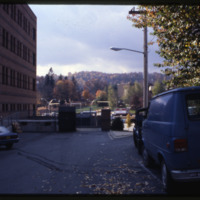 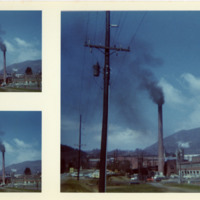 This color slide shows an alleyway leading to a south-facing view of Appalachian State University. 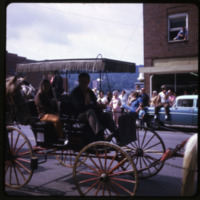 The notation on the slide reads "access to ASU." 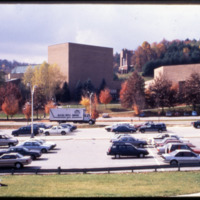 This color slide shows a view of Appalachian State University, including Schaefer Center for the Performing Arts and Hayes School of Music. 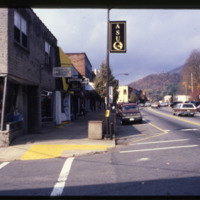 This color slide shows a south-facing view the Hayes School of Music and other Appalachian State University buildings from a downtown apartment building parking lot. 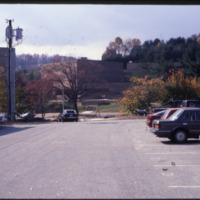 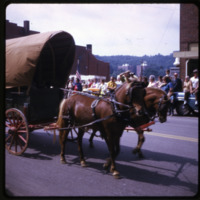 This color slide shows the Raley Parking Lot on Rivers Street at Appalachian State University. 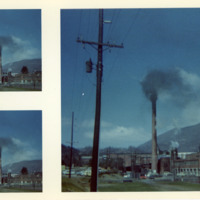 The tall brown building in the background is the Schaefer Center. 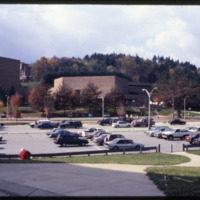 The shorter brown building at right is the Broyhill Music Center.